Not all democrats support Neo-liberals; usually, moderate liberals also have discrepancies with Neo-liberals. Neo-liberals themselves have different ideological perspectives that conflict with one another, but they all unite in eradicating any form of conservatism which traditionally embraces nationalism. These extremist thinkers are trying to change the constitution under which the US was established; into a world where science, technocracy and diplomacy become the thumb of rule. As I predicted a few years ago, the evident wane of US hegemony will cause a global shift in international affairs directed by geo-strategic players like Russia, China and possibly India. This shift began in the US decades ago with the rise of liberalism, which gained momentum over the years; the new generation of liberal chauvinist, the Neo-liberals, has enforced an ideological scuffle in government directed against conservative values. The decline has extended to the geo-political arena, where other nationalist countries have started to wake up from slumber to permeate their international influence in the world stage with increased military action. Once one of these aspiring superpowers wages military campaigns without respect for US sovereignty, it’s an unmistakable historical sign that the situation will escalate in the present future. China and Russia have detected weakness on the part of US foreign policy, and have recently launched military campaigns in Ukraine, Crimea, the South East Asian Sea and Syria as part of the forthcoming geo-strategic swing. Obama’s austere response to Assad’s regime after the Ghouta chemical attack on Damacus in Syria, has clearly shown the Achilles’ heel of US intervention policy after Obama vowed to attack Syrian Army strongholds in retaliation for using sarin-gas on civilians, but flaked soon afterwards from his remark. The foreign perils brought by neo-liberalism in the past 2 decades has weakened the US military core substituting the phrase ‘peace through strength’ praised by Ronald Reagan, for gibberish progressive jargon which has deteriorated the core-belief of nationalism, patriotism and militarism. This is evident in Europe where liberalism over the decades has tainted the notion of nationalism creating dissension among autonomist, regionalist and separatist that diverge with state sovereignty. The Neo-liberalist hostility toward national conservatism won’t be left unnoticed. After years of manipulating education and media outlets to demonize religion and military, this has resulted in a battle of moral attrition that won’t favor liberalism as history unequivocally shown in other past civilizations with faded nationalism. What the American people should expect in the upcoming years are conservative states in the south that will increasingly question federal government proceedings for their national and geo-political demise; these conservative states will eventually veto all reforms initiated by neo-liberal states bearing in mind the present austere antipathy they experience with education, military and religion. As the economy slows, taxes increase, global hegemony shifts, foreign markets spread, new political dogmas emerge and evident ideological discrepancies start to erode nationalism; Neo-liberals in their quest to control the US government will find themselves wedged in the middle of disunity to implode a second civil war. The high rise of ignorance started by Neo-liberalism will take part in the political debacle; capitalism will also trigger hate among high unemployed low socio-economic Americans that visualize the government as conspirators against their own people. Ignorance, treachery and materialism will swerve dramatically against those that endorse their values; Materialism, skepticism, slothfulness, the idea of ‘survival of the fittest’, scientific validity, global unawareness and other factors have created the perfect conditions for an abrupt revolution to take place in the US. Desperation from both political ends will provoke national paradox. Southern separatist will promptly reemerge in great numbers. Political assassinations directed at congressmen will unfold and turn into riots, and riots will turn into political assassinations. Southern states will defy the US constitution and finally separate to become independent. The military will fathom the situation, abet with southern states and betray the Neo-liberal government which they view as insubordinate. This has become apparent with the Pentagon rejecting Obama’s foreign policy reform in the Middle East as an act of defiance to US sovereignty; just as Bill Clinton cut troops during his administration to cement his legacy, Obama has also cut troops in Alaska, Iraq and Afghanistan to promote an imaginary laissez-faire world for the sake of his legacy without military endorsement; it will inevitably backfire. The odds of the US splitting into two separate countries will appear soon after an economic recession strikes the foundations of the already precarious financial system. The consequences won’t shuffle in favor of what most liberals predicted as they acted unwisely, vilifying others that opposed their worldview; powerless and without a military to protect their interest, they will view the rise of the military as seditious towards liberty. The Neo-liberal establishment that once viewed religious followers as primitive thinkers, conservatives as ignorant rednecks, and the military apparatus like brainwashed cavemen will succumb by those it once mocked. 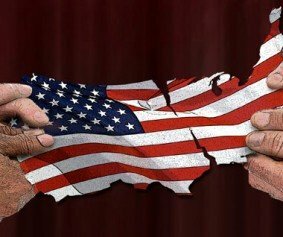 If the split happens under the right circumstances a civil war can be prevented and two nations will arise from the ashes of the old US; If, on the other hand the military decides for all Neo-liberal states to submit all national sovereignty to the armed forces, revolts will spark followed with a brutal civil-war that will annihilate millions of Americans. Considering the size of the US, a civil war could last well over a decade. Europe will no longer be capable of maintaining global security. The US will cease all foreign occupations; friends and allies will be left behind, and trade laws will change in favor of the new superpowers. Taiwan, Saudi Arabia and Israel will suffer the biggest challenges with the abrupt geo-political change. NATO, eroded by liberal influence will militarily succumb with the global shift and lose all powers. Without the US, the world will be supervised by Russia and China. The US will no longer retain the worldwide influence it once had, and by the time the national split occurs the world will have to curtsy to Chinese and Russian demands. The ancient Persian dominance will notably take place in the Middle East with Iran. Some people view my prediction farfetched. Those who don’t see these events unfold mostly willingly ignore history is cyclical and not progressive; ignorance, laziness and materialism have created brainless people who believe everything they are told. Manipulating educational institutions to reject alternative theories has made the ignorant population aware of a possible conspiracy aimed at destroying religion and nationalism on behalf of science. Diplomacy and democracy sponsored by technocrats and Neo-liberalist have completely aggravated the notion of nation, sovereignty and military into a world of fantasy orchestrated with the notion of peace without strength. It’s time to reconsider the serious repercussions Neo-liberalism will pose to the nation’s future once a financial recession shakes the pillars of the US economy while losing power abroad. Republicans and democrats pan one another in congress, but fail to address the real issue; the ideological phenomena that will destroy the core of American hegemony. The US can survive the next financial turmoil with strong nationalism, but it cannot survive the ideological schism boiling and continue to thrive as a superpower.